I recently shared with you my latest obsession...baby clothes!! :) Another great site that is feeding my obsession and making me very happy is Wooky Baby! They offer some great choices when it comes to their clothing - you can buy or rent! Babies grow fast! Wooky Baby, a clothing rental service for size 0-3T, was founded with the goal of reducing the "cost-per-wear" of children's clothing. At an average of $8 per outfit, a customer can save upwards of $50 by renting instead of purchasing an outfit that a child may only end up wearing once or twice. 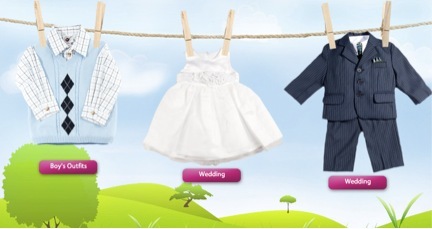 Wooky Baby clothing rental service is not only cost-effective but also environmentally responsible. The option to purchase outfits (new and used) was recently added to the site! Wooky Baby offers unique, fun clothes that are changing daily. Labels include Burberry, Florence Eisman, Good Lad, and Bonnie Baby. The Wooky Baby online catalog works like most shopping carts. There is a $5 flat rate shipping fee which includes the cost of a label to return the items when the child is finished wearing the clothes. The clothes can be returned with the supplied shipping bag and label provided via email. The shipping bag will be picked up in the mailbox by the postal service. The cost includes a one-month rental, but the clothes can be kept for longer. A recurring fee will be charged for each month the clothes are rented. 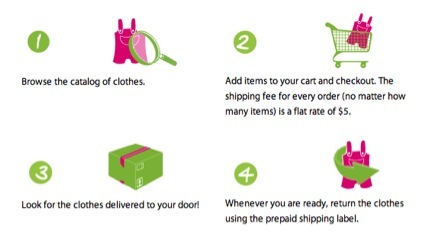 The $5 flat rate shipping fee applies to both the rental and/or purchase of as many outfits in your order! I received two of the cutest items from Wooky Baby - a Christening gown for my daughter's baptism and a cute summer dress! Both dresses are high quality and extremely CUTE! I can't wait to hand the Christening gown down through all my children and their children and make it a family heirloom! The cute "Fresh Citrus" cotton dress is light and airy and will be perfect for keeping my daughter cool and CUTE as the summer heats up! I love that Wooky Baby is striving to save all of us "baby clothes obsessors" (like me) money by letting us rent the clothes until they grow out of them...which happens very fast when they are so young! It is a great idea and their clothes are very reasonably priced! Buy It: You can purchase or rent Wooky Baby clothing from the Wooky Baby website. Wooky Baby is also offering my great readers a coupon coupon for FREE SHIPPING! Win It: Wooky Baby is generously offering (1) $40 gift certificate to a lucky winner!